Will Gold Hold $1300 This Time? In the early morning trade, April gold is currently up $10 and trading at $1,296.6 an ounce. The shiny one has held the $1,275.0 support level and broke new weekly highs overnight. With the U.S. greenback selling off, it has fortunately helped the bull camp along with word yesterday that U.S./China trade negotiations were not as close as once thought. However, the biggest factor of the overnight gold rally is that the Fed is considering an earlier end to quantitative tightening, which basically means the central bank will decrease the amount of liquidity within the economy. Also, they will pay less attention to inflation in the near term as well, which should be seen as another piece of news for the gold bulls. If you take a quick look at the daily April gold chart, you can clearly see how gold is approaching $1,300 and if it holds this time there is clearly little resistance after that level. Furthermore, the technicians are closely watching the very bullish momentum pattern of the golden cross, which is when the 50-day crosses above the 200-day as it starts sloping up. I highlighted this pattern below on my RJO Futures Pro daily April gold chart. Silver futures have been pivoting both sides of the 200-day moving average recently. The 200-day comes in at $15.63 for the May futures contract. Another close above $15.75 will promote a secondary rally driving prices to challenge the $16.00 level. Due to the fact that silver futures are such a volatile contract, I think that the $17.00 price range is not much of a stretch once the $16.00 level is violated. Just look how silver rallied after taking out the $15.00 level. This market is set up, technically, for additional rallies. We cannot talk about silver and not mention gold. Gold is typically the leader, but we also must look at the price differential. The gold to silver ratio is now 82.3 to 1. When silver finally starts to run, you want to already be on that train. Silver has a lot of catching up to do! A move back to $18.00 is not “crazy” talk. One should consider some intermediate term bull call spreads with low risk and big return potential. 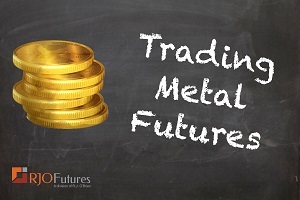 If you would like to discuss strategies that use the leverage of futures with low, limited risk options spreads. As of Thursday morning, the March crude contract is trading little changed as the market weighs the upcoming holiday delayed EIA report following a bearish API number last night, which showed a large build. The market is also weighing such factors as the possibility of slowing global growth and geopolitical tension, with Venezuelan turmoil now at the forefront. There is talk of sanctions as the a number of nations recognize the newly sworn in president while Maduro refuses to step down. While the market’s uncertainty is seen from the flat price action this morning, it is also interesting to note the multi-year lows in the spread between crude oil and RBOB gasoline pictured below. While short-term traders may want to play volatility in the upcoming EIA report and possible Venezuelan sanctions, longer-term traders may want to position in the multiyear lows in the crack spread. Technically, as visible in the in daily chart of crude below, the market seems poised for a move. While time frame, risk capital and risk tolerance should always be factored, it would seem these energy markets currently offer several opportunities to position considering those factors. Once again, the price action on natural gas has slipped into a small range. Short-term it is downward trend and could challenge the lower end of the trading range. A close below the range $2.770 could send trading into a new range, where the former bottom becomes the resistance. I don’t think it will happen, but crazier things happened around expiration of the Feb contract and options. A close above $3.150 may put the bulls in control and send the prices much higher. I believe this is the more likely to happen. Momentum indicators are at mid-levels and moving averages are mixed at best. The next week or so calls for colder temperatures however, gas production is ahead of last years production. A smaller withdrawal is expected on the next storage report. The weather has a decided warming trend early in Feb and may call for less consumption. The polar vortex may return, and support natty prices. The weather will be the determining factor in the price until the heating season ends. I think up in the short term will be the path of least resistance. If you have any questions or would like to discuss the markets further, please feel free to contact me at 888-874-8110 or jratajczak@rjofutures.com. With global trade tension across the globe affecting most commodities, cocoa has also found some weakness. Technically, the chart is turning bearish. The March contract found some support at 2240, but has the potential to break lower off the recent grinding data and weaker demand tone. If 2225 is broken, look for 2160 to be tested. The weaker Euro is also pressuring European demand. Traders are also looking to Ivory Coast arrivals for guidance. With the recent weather fronts in West Africa producing light rainfall, we could see production expectations move higher, also causing concerns for lower futures prices. While traders continue to trade the March futures contract and position themselves to move into the May, look at upcoming arrival and production data for guidance. Traders will also need to monitor trade talks and the US government shut down which has pressured the markets. Continued strength in the Brazilian real, along with uncertainty in supplies seems to be prompting enough buying to provide support to March coffee prices. This is a market that has been in a complete freefall for quite some time and turning this massive ship around will require patience. There have been reports of high temps on their way to key Brazilian growing areas, and this forecasted heat may add some additional pressure to crops, prompting even more support buying. With a continued strong U.S. dollar and volatile stock market, I would expect to see some sideways price action before another big leg higher in March coffee prices. The weather outlook for soybeans is still a bit supportive but even with a 5-7 million tonne drop in Brazil production, global stocks appear extremely burdensome. China imported just 16.64 million tonnes of beans from the U.S. in 2018, down almost 50% from 2017. The soybeans traded firmer yesterday, discounting Tuesday’s reports that Trump rejected an offer from the Chinese to meet with two vice-ministers this week. There were some positive comments made by Larry Kudlow and Secretary of State Pompeo, which should support. Less than ideal weather in South America with dryness in Brazil and heavy rains in Argentina are also supporting factors. The market is still in a bullish posture from a technical standpoint. Resistance comes in at 918 and 922 while support hits at 910 and 907. If it wasn’t for the extreme bearishness coming from Soybean stocks, corn would have the fundamentals to hold a bullish tone moving forward. Both U.S. and world stocks for corn look to tighten, and a 3% below trend yield would put us at the tightest stocks/usage on record. China imported 420,000 tonnes of corn in December which was the highest for last year but still down 8% from 2017. With U.S. government shutdown still ongoing, the trade talks next week will continue to be the focus for the trade. Resistance comes in at 380 and 383 while support hits at 377 and 375. Tighten Hog Bear Risk "Down Here"
Yesterday's continued slide, this time below 16-Jan's 64.02 low in the now-prompt Apr contract detailed in the hourly chart below, reinforces our bearish count introduced in 17-Dec's Technical Blog and leaves 18-Jan's 67.40 high in its wake as the latest key corrective high this market now is minimally required to recover above to arrest a 2-month, 13% decline. Per such this 67.40 high is considered our new key risk parameter to which traders can objectively rebase and manage the risk of a bearish policy and exposure. Near Term Recovery in Yen? The Japanese Yen appears to have found support and garnered safe haven interest amid weakness across global equity markets as well as ongoing concerns involving growth. Recent data released from China showed the Chinese economy expanded at a rate of 6.6% last year, the slowest pace in almost thirty years. The International Monetary Fund further revised its outlook and forecast for world economic growth in 2019 to 3.5% from 3.7% in October and 3.9% last July. Ongoing concerns remain regarding U.S. – China trade talks as well as the government shutdown which will continue to provide underlying support. The market remains bullish trend (107.60 -110.10 fx) with near term support seen around 91.55 and resistance around 92.07. Stock indices are all up over one percent in the early going of today’s session. At the FOMC meeting back on December 19, Fed Chair Jerome Powell suggested that the United States economy is slowing and cast some doubt on the previously stated intentions of the Fed to raise somewhat aggressively in 2019. This further confirmed what many economists had been forecasting, and the market continued its decline to levels unseen since March of 2017. An article in this morning’s Wall Street Journal suggests that The Fed may be close to ending its portfolio wind-down. We’ll see if this indeed turns out to be the case, but it has been enough to pump the breaks on this week’s downturn and recoup much of the losses. The next FOMC meeting takes place next Wednesday, January 30th. We’ll also see Q4 GDP that morning, so it is likely to be an eventful trading session. Several analysts are suggesting that we’ll come in well below the prior reading of 3.4%. It will be interesting how the market responds in the event GDP comes out weak and the Fed suggests in the midst of ending their tightening policy.